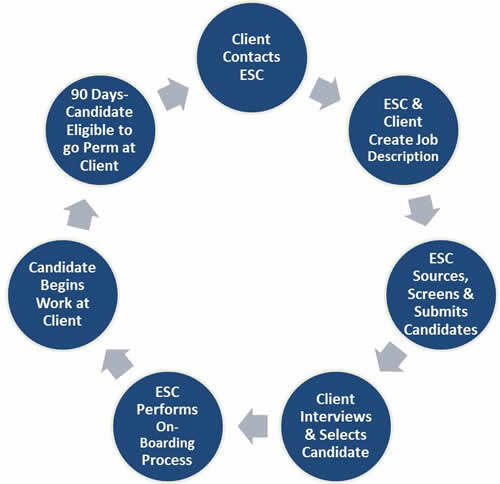 The contract-to-hire option provides a solution allowing for a “trial run” with the candidate. Clients are billed based upon hours worked by the candidate. Our contract-to-hire candidates receive an hourly wage and no additional fringe benefits during the contracted assignment. We utilize this approach to ensure that candidates are committed to ultimately becoming a permanent employee at the client location. The goal behind the contract-to-hire option is to ensure a win-win for all parties involved, by allowing each party to fully explore the others work habits and work environment. Additionally, we charge no additional “buyout” to customers after the negotiated contract period has been met.